The Apex radio has an integrated clock which has an alarm function which will allow you to wake up to your favourite radio station. Telescopic antenna to catch the best signal in the area. Item is great for camping and holidays. 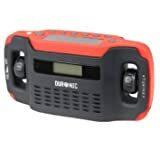 Size of radio – H:7.5cm, L:15cm, W:5.5cm. Radio will give upto 9 hours after fully charged and 6 hours of flashlight use after fully charged.